Is the West DIRECTLY Responsible for the Massacres In Ukraine? Indeed, the German newspaper apparently claim that the American mercenaries are directing and coordinating the attacks by the fascist Right Sector militia. Blackwater is more or less an extension of the CIA. There are also dozens of CIA and FBI “advisors” in Ukraine, and the CIA director visited Kiev before the massacres started. In any event, even if the U.S. is not directly responsible for the massacres, we are certainly indirectly responsible. After all, the U.S. is backing neo-Nazis in Ukraine (and see this). The leader of the “protests” in February 2014 which ousted the president of Ukraine (Andriy Parubiy) is a neo Nazi and follower of a prominent WWII Ukrainian Nazi. He’s now the head of national security in Ukraine. In that role, he has organized neo-Nazi brigades to murder Russian-speaking Ukrainians en masse. Ukrainian Neo-Nazi throws Molotov cocktail at Russians. Image courtesy of PBS. While the Guardian attempts to justify American meddling in multiple nations as an attempt to “salvage rigged elections and topple unsavoury regimes,” it does not deny that the meddling took place and goes on to explain in great detail just how that meddling was carried out. The ultra-right Neo-Nazis now occupying Kiev in the wake of the so-called “Euromaidan,” are the heirs of the “Orange Revolution.” The parties that benefited from 2004’s unrest, including the “Fatherland Party,” now hold power. While the “Orange Revolution” was carried out more covertly, the “Euromaidan” was openly backed by both the US and the European Union. 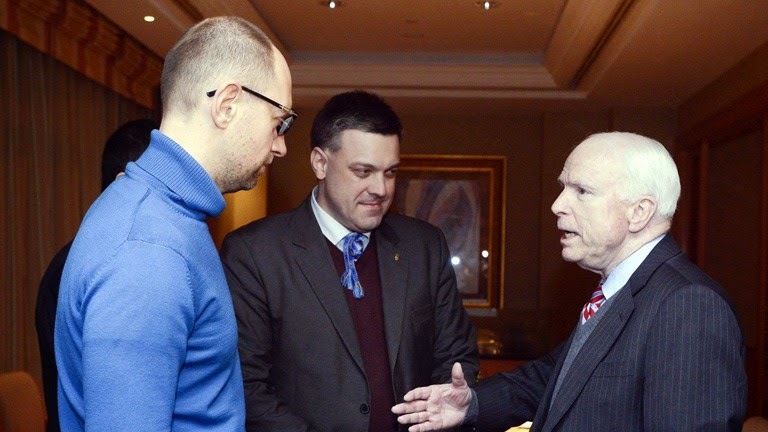 At the height of the protests, US Senator John McCain would literally take the stage with the ultra-right, Neo-Nazi Svoboda Party leaders as well as meet with “Fatherland Party” member and future “prime minister,” Arseniy Yatsenyuk. Over the weekend, CIA director John Brennan travelled to Kiev, nobody knows exactly why, but some speculate that he intends to open US intelligence resources to Ukrainian leaders about real-time Russian military maneuvers. The US has, thus far, refrained from sharing such knowledge because Moscow is believed to have penetrated much of Ukraine’s communications systems – and Washington isn’t about to hand over its surveillance secrets to the Russians. Forbes would continue by suggesting arrangements were being made to prepare Ukraine for a possible proxy war with Russia – describing the shortcomings of Western backing during another proxy confrontation with Russia, the Georgia-Russia conflict in 2008 where Western equipped Georgian troops were humiliated after invading South Ossetia and incurring a counterattack by superior Russian forces. The West has invested heavily in covering up the fact that its new proxies in Kiev are ultra-right Neo-Nazis. However, the Western media itself has, in the past, extensively documented the nature of each of the most prominent groups that compose the current, unelected regime. The Svoboda party also has excellent ties to Europe, but they are different from the ones that Klischko might prefer. It is allied with France’s right-wing Front National and with the Italian neo-fascist group Fiamma Tricolore. But when it comes to the oppression of homosexuality, representative [Igor] Myroshnychenko is very close to Russian President Vladimir Putin, even if he does all he can to counter Moscow’s influence in his country. There have been other, similar incidents. In a 2012 debate over the Ukrainian-born American actress Mila Kunis, he said that she wasn’t Ukrainian, rather she was a “Jewess.”Indeed, anti-Semitism is part of the extremist party’s platform; until 2004, they called themselves the Social-National Party of Ukraine in an intentional reference to Adolf Hitler’s National Socialist party. Just last summer, a prominent leader of party youth was distributing texts from Nazi propaganda head Joseph Goebbels translated into Ukrainian. In December US senator John McCain travelled to Ukraine to offer his support to the opposition, appearing on stage with leaders of the three opposition parties leading the protests – including the far-right Svoboda party. Svoboda is currently Ukraine’s fourth biggest party and holds 36 seats in parliament. It is also part of the Alliance of European National Movements, along with the BNP and Hungary’s Jobbik. Svoboda leader Oleh Tyahnybok is one of the faces of the protests, appearing regularly along with opposition leader and former boxer Vitali Klitschko (see picture right) voicing opposition to Putin’s influence over the region. However, Tyahnybok has provoked controversy in the past with his anti-Semitic claims that a “Moscow-Jewish mafia” controls Ukraine. Despite the controversy his statements attracted in the West, Tyahnybok was voted Person of the Year by readers of Ukrainian news magazine Korrespondent last year. The Fatherland Party, which is leading the coalition junta, even in name alone echos the disturbing nationalist nomenclature of Adolf Hitler’s Nazi Party. Beneath the rhetorical similarities are disturbing parallels of more substance. Leading Ukraine Opposition figure, Arseniy Yatsenyuk, risks disappointing liberal supporters of his All-Ukrainian Union “Fatherland” party, having publicly rejected gay marriage at a recent rally. But Yatsenyuk, who leads “Fatherland” in the absence of jailed leader Yulia Tymoshenko, revealed that he rejects gay marriage because his personal beliefs stand in the way of any political position. And while the West parades out before global audiences “Jewish” commentators claiming the new regime is free of antisemitism, growing fear has been documented amongst Ukraine’s Jewish population during the last decade the West has been propping up the ultra-right. An interesting report in the wake of the Fatherland Party’s failed attempt to take power during 2010′s elections by The Jewish Week titled, “Change For Ukraine, But Likely Not For Jews,” portrayed Ukraine’s Jews in fear of a potential win by “Fatherland” which was perceived as both nationalist and anti-Semitic. A video report published in 2012 on Jewish News One titled, “Ukraine far-right Svoboda party anti-Semitism,” further exposes the West’s current narrative regarding their proxies in Kiev as nothing more than a public relations campaign designed to cover up what is essentially a Nazis regime.